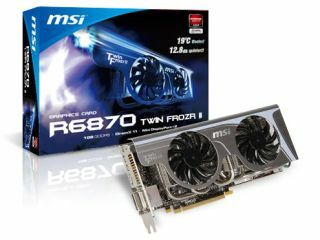 MSI has announced the R6870 Twin Frozr II – with the latest addition to its AMD-toting graphics card range coming soon. The R6870 features the Twin Frozr II cooler found on MSI's Lightning and Hawk graphics cards. "The Twin Frozr II cooler found on the R6870 Twin Frozr II consists of a large Nickel-plated copper base heat sink with five SuperPipe equipped heat pipes connection to a high density aluminium fin array for excellent heat dissipation," explains MSI's release. The DirectX 11 card apparently runs at 19 degrees centigrade cooler and 12.bdB lower sound volume than the reference card. "The R6870 Twin Frozr II gives you a better computing environment and more headroom to overclock your card with MSI's unique Afterburner version 2 software, adds MSI. "With the enhanced cooler performance and usage of Japanese solid capacitors MSI's R6870 becomes the best choice for everyone looking for a cool graphics card, low noise environment and expanded overclocking potential."